HABIT: Large, dramatic plant that should normally be treated as an annual. Huge gray-green, deeply cut, fuzzy leaves. 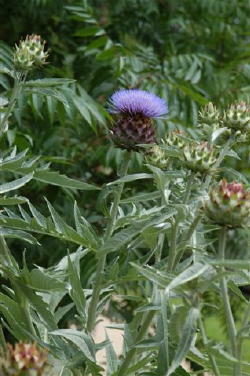 Forms dramatic purple flowers that resemble thistle. CULTURE: Likes deep, moist soil during the growing season but will rot in wet soil in the winter. USES: Leaf stalks to soups and stews. Dramatic or decorative specimen or a backdrop plant for larger herb gardens. PROBLEMS: Can’t stand wet feet. 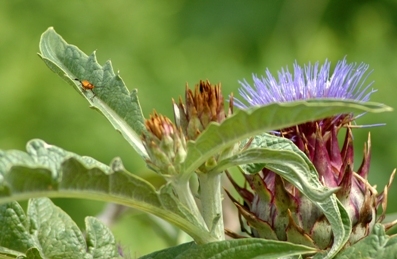 Grows very large, not suitable for small herb gardens. HARVEST: Use fresh leaf as needed. NOTES: Mice like the seed, so be careful with the propagation location. 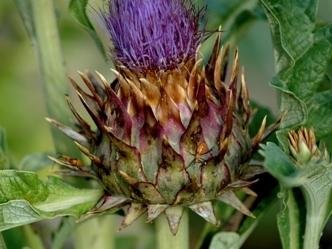 Cardoon is a very close relative of the edible globe artichoke.